The City Methodist Church in Gary, Indiana hasn’t held a service since the early 1970s, yet it still stands in the middle of downtown Gary, Indiana. 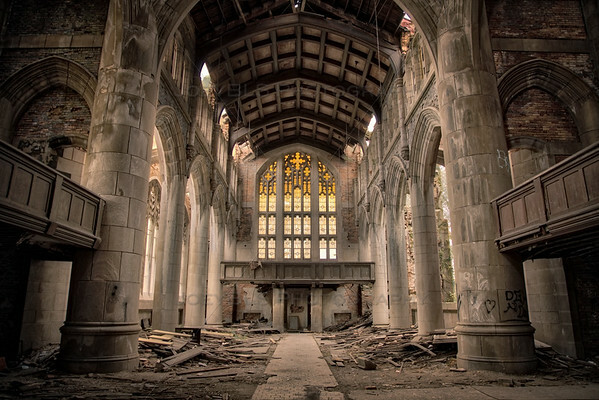 The City Methodist Church has been a focal point of urban exploration in Gary, Indiana for decades. It’s beautiful gothic architecture, interior stone arches and stained glass windows, is truly a site to see. Much of the wood still remains, however nearly all of the metal in the building has long been scavenged by scrappers and the like. Gary, Indiana is a fascinating place to be as an urbex photographer. There are many buildings that are still standing and in complete disrepair. Be sure to check out my photos of Union Station in Gary as well as photos taken at the former post office and the Palace Theater on Broadway in the heart of downtown Gary. City Methodist Church, Gary, Indiana by Joey B. Lax-Salinas is licensed under a Creative Commons Attribution-NonCommercial-NoDerivs 3.0 Unported License. Permissions beyond the scope of this license may be available at http://www.joeyblsphotography.com.